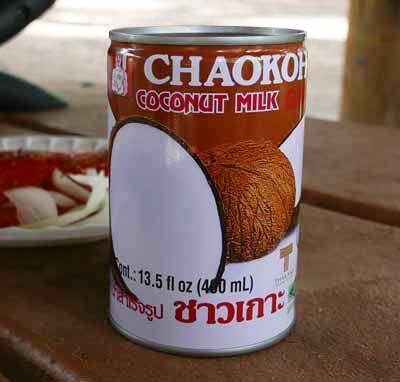 High quality coconut milk, Chaokoh brand, imported from Thailand, is what we've offered for 20 years in the most convenient 5.6 oz and 13.5 oz serving sizes. Ingredients: coconut extract, water, citric acid (as antioxidant), sodium metabisulfite (as perservative). Unsweetened. Add to Cart Buy 1 can, 5.6 oz, $1.39. Add to Cart Buy 10 cans, 5.6 oz, $10.89. Add to Cart Buy 1 can, 13.5 oz, $2.89.